Magic Whiteboard can help you pass your exams!! It's an ideal revision aid. Write your revision notes on the sheets and stick them around your house - no marks will be left on the walls. This will help you remember. Ideal for bedroom walls and windows. Teachers, students and parents are regular customers. 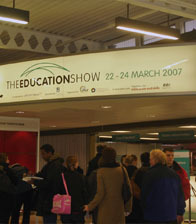 The Education Show is the UK’s leading educational resources event. It provides a showcase for teachers from all levels and specialisms to review test and compare the widest range of resources. For educators dealing with pre-school to further education, there is no other show like it! Come and see us at stand L119 and get a FREE sample. Magic Whiteboard is delighted to announce they have been entered in the Learning Innovation of the Year category at the prestigious World of Learning Awards that are being held at the NEC. Judged by an independent panel of industry experts, these awards recognise and reward organisation and people who have significantly advanced workplace productivity and performance. We are looking forward to the ceremony on 14 November 2006. 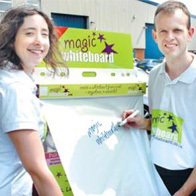 Magic Whiteboard at the Daily Mail World of Learning Exhibition!